It’s been 22 years since its release and the unit is still going strong. Even the latest in Roland’s series, Integra is in fact based on the DNA of the legendary JD-990. But let’s get back in the the 90s for now and see how it all happened. 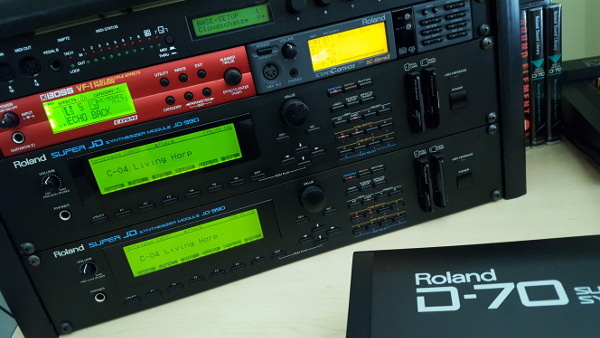 First of all, it should be noted that when model 990 came out, market (at least the Roland’s portion of it) was already dominated by the JD-800, D-70 and the quite popular JV-80 which came year earlier in 1992. Being there at that time i can tell you we considered JD-800 as a Rolls Royce, way out of our reach, but JV-80 was definitely second best, and it sounded incredibly good (for that time) with nice juicy digital resonant filters, for all of us who were into electronic music back then. Just a year later 990 came out. But for some reason it went under the radar for the most of us. It was mostly taken by studios and the pro’s. Little did we know how powerful this synth was (internet was very limited back then, there was no such thing as Gearslutz) while reading some brochure isn’t going to tell you much about it neither. But there was another group of people, like film composers, producers, you know people who can recognize certain things such as good audio quality right away. Many of them kept their JD-990 despite JV-1080 being the star of the show with all the spotlights focused when it came out. The reason was simple JD-990 was soundwise class above 1080 and those who had it didn’t want to let it go that easy. Technical differences between 990 and 1080 are explained here. Unfortunately JD-990 wasn’t perfect and had some drawbacks compared to JV-1080 which is why some studios and composers decided to use both (such as for example Vangelis did). Drawbacks are obvious smaller waveform ROM content compared to 1080 ROM, and nasty digital distortion at higher resonance values. This is why in model 1080 Roland implemented variable waveform gain to avoid such scenarios happen ever again (unless you intentionally want them). It is a know fact that Super JV’s architecture is based on the JD-990. On top of that it comes with the same type of aggressive filter (as opposed to other JV series like JV-80, JV-90 and JV-1000 which had mellower filter resonance) and it came with the now legendary “structures”. When the XV series came out, Roland continued the DNA line of the Super JV. The only thing “different” was that its SYX patch data was based on JV line of synths. Hence why XV can normally load Super JV patches via sysex, yet is unable to load the JD-990 patches. Then the Fantom came out, which again is based on the same concept. And now we have the Integra, which continues where XV series left, maintaining full compatibility and architecture of the Super JV. All of these synths are based on a revolutionary concept of a JD-990 synthesizer. And this is what makes it so special, along with its wide lush sound. Wave ROM was expanded to 6MB (vs 4MB on JD-800) with 195 PCM waveforms (vs 108 on JD-800). Pan inside each Tone was added. On the JD-800 you can NOT pan individual tone for wide stereo sounds. Matrix modulation was added on the JD-990. Let’s explain this – on JD-800 you can’t: increase cutoff point of Tone 1, decrease cutoff of Tone 2, increase resonance of Tone 3, decrease pitch of Tone 4 – all at the same time by moving the modulation wheel. Multiple sources for the same destination added. On JD-990 you can for example use two different LFOs for the same destination – i.e. pitch, filter, TVA. This can create complex modulations. On JD-800 you can only use one source for the same destination. The LFO section has additional waveforms: sine, trapezoid and chaos. Osc Sync function was added. It lets you synchronise two oscillators – a feature found in many analogue synthesisers. FXM was added (Frequency Cross Modulation) – again found in some analogue synthesisers. It has 8 positions (labelled Color) that actually control the frequency of the modulating signal, and a depth setting 0 – 100 that controls the amplitude of the modulating signal. Ring Modulation, for creating all kind of metallic percussion and strange effects. This synth features 6 types of ”structures” which among many other things let you stack two filters in series, for building complex filter textures. 24 dB filter (using structures), next to standard 12 dB which is always available. Outputs increased to 8 total. Analog Feel. Which adds a random modulation to the sound to recreate an analogue synth’s “drift”. Not just on the pitch, but varying amplitude also. Some people asked me about my opinion on JD-800 so i will give it just a brief info on why i never became an owner.I find JD-800 good as a performance synth and that’s about it. I’ve played JD-800, really liked the UI, thought of buying it, but got distracted by the fact there’s no even basic modulation matrix i.e. you can’t set modulation wheel on JD-800 to open the filter and apply some resonance. In fact there’s no even mod wheel on JD-800. Also, all the modulation buses on JD-800 are pre routed. You can’t use two or more sources to modulate the same destination (for complex modular style modulations). On top of that JD-800 is monaural per patch, there’s no pan feature per individual tone – so you can forget wide pads evolving through stereo field, which is a signature of many JD-990 sounds. Thank you for the beautiful articles ! Back in the 90’s and begin 2000 ,it was the heart of my productions. I made a lot of ambient/dreamhouse cd’s. And the JD was the key of it. I can say,the JD990 was one of the best modules/synth I ever bought. It’s the only one,from the 90’s I never sold. Even writing about it,it gives me sparkles. If I should rate it,I would give 9.5 out of 10. I’m on Mac and I usually used to use “Sysex Librarian by Snoize” with my D550 / MKS70 etc. advance thank you kindly tell me the “functions” where the “operation” to be performed on the JD990 to load Sysex in this JD? Will you ever be able to release a 990 sample pack? Wow!! Great reading this. Thanks for the explanations. I still own my JD-800, and two JD-990’s. I’ve always felt I should never sell my JD-990’s, reading this thread has confirmed that!! I have the Vintage Synth Expansion board in one and the Vocal Collection expansion board in the other. Because the Vocal Collection had special JD-990 specific programs I opted to install that board in one of my 990’s and same with the Vintage Synth expansion. While I have some of the “same” Take 6 Vocal samples in my Kurzweil PC2-X, there’s something about the way they play and sound in my JD-990 that I prefer. Hello Don, I own a JD-990 with vintage synth boards and I like the instrument very much! I agree with you when you write it’s the best sounding Roland rompler/synth module from the nineties. However I have a Yamaha WX wind controller too and designed several sounds for de 990 that make use of CC2. From this experience I have to add a nuance to your praise of the JD-990. When playing the JD from the WX and controlling the oscillator pitch with the WX reed (like a sax player would do) the JD-990 appears to have a nasty aliasing sound in the higher range which is so audible these sounds have to be disqualified for recording purposes :-(. That’s a pity because the sounds themselves have a beautiful high end and I would like to use them for recording but this is a no go. I can send you audio examples of this if you like. I discovered it’s the same when using LFO vibrato, so it’s not a controller only issue. Which waveforms did you notice this on? Any modulation just makes aliasing much easier to hear (brain picks out the aliases moving in different direction from wanted harmoncis), but the aliasing is there already in the unmodulated sound. Please help me with my sliders. They’re only registering the max and minimum values with nothing between. Any help is so greatly appreciated. I’ve completed my education to be able to program patches and do sound design, not to repair synthesizers. I think you confused me with someone else. Best regards! Reading this was great and brought back several memories for me. I can certainly relate. I had just bought a JV-880 and was saving up for the JD-990. I could not make up my mind on whether or not to buy the JD-990 or the JD-800 and it was late 1993-early 1994. I finally saved enough money and decided on the JD-990. I already owned a D-50 and the D-70 and wasn’t crazy at the time of buying a third keyboard. When i got to the music dealer the only JD-990 he had in stock was already sold. He said he could not get a new one because they had been discontinued. Then he said, “but you don’t want one anyway”. “You want the JV-1080 which blows the 990’s socks off because it has twice the memory and sounds.” SO i waited until after i got married that summer and bought the JV-1080 the next year. 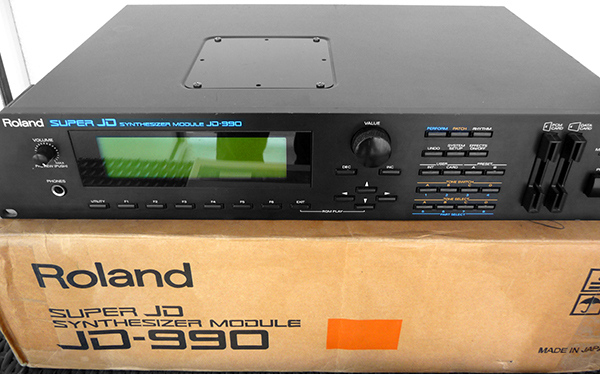 I regretted not finding a JD-990 for years and when i just saw one last year on e-bay i jumped on it like a pig in slop! Very happy i did. Sitting next to an XV-5080, XV-3080 and JV-1080 in the rack, the JD-990 doesn’t miss a beat and holds it’s own with icon sound. It sounds just as good as the Triton Rack and TR Rack that sit just below it in the rack. Hi Don, I have a 990 that is currently boxed due to busy life and moving around alot, but would like to keep it in shape. -Does it require a battery replacement, for the integrity of the presets? Great informative article. But where does the S760 and SP-700 fit into this? Are they basically a JD-990 with sample input/user ROMs sans effects, or are there sonical differences apart from that? Does anyone have the 1,2,3 steps to program this JV 1080? I have been more than three days going back and forward ang again……….. Someone should have a simple 1,2,3 steps instructions to program this guy. Thanks for your information.